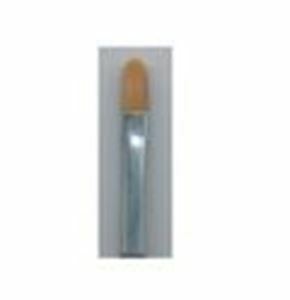 Artificial hair brushes are suitable for fine lines and face-painting. The hairs may become discoloured in time but this is not detrimental to the make-up results. Various shapes are available: round (S2), straight top (S6), filbert (SL6) and rounded top (SV6). They have a grey stem and the number indicates the width in mm. These brushes can be cleaned with shampoo or soap and water. After washing, the wet hairs should be moulded into the right shape by hand and leave the brush to dry on a tea-towel. It is not advisable to leave the brush upright during drying because the water will then be absorbed into the shaft. Do not leave brushes standing in water for long periods as this is bad for the hairs. The hairs may be discoloured over the course of time but this has no effect whatsoever on the make-up results.